Due for release from the Ragdoll import -label is the CD ''Please, Stay In Your Seats'. It contains an audience recording of the May 28, 1977 show as recorded at the spectrum in Philadelphia, PA. taken straight from the 1st generation audience recorded master tape. The 8:30 show has previously been released as "Philadelphia 77 - Last Time In Spectrum". 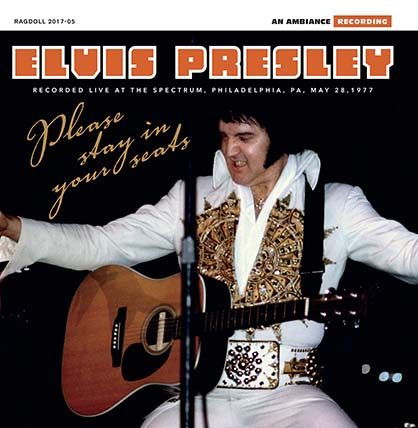 This show features a fine show, with Elvis in good spirits, doing fine versions of ''Polk Salad Annie'' ''My Way'' ''Little Sister'' among others, a very young Bruce Springsteen was in the audience this night, and he noted ''I remember enjoying the show tremendously'' while also acknowledging ''It was not a good night'', we feel it's up to you to judge what you think of this show.